Ok, well my sunflower is red and yellow and my card has no sentiment on it (which I just realized completely forgot to do!) but I still think this is one of my favorite cards I've made in a while!! I used Ruby Red, some pattern papers from Crate Paper's "Restoration" pack, Harvest Gold, black and vanilla which are also colors for this week's Color Throwdown Challenge. A few weeks ago I won the "Card Cupids" Challenge and my prize was 5 digis from "The Stamping Boutique" this little sunflower girl was one of the images that I chose. I love it! She was was so much fun to color and use. I colored her with lots of Copic Markers: sky (B000), Flower (Y35, R20, R22, R24, R27), Leaves and stem (G21, G24 and G28 ), Hair (E07, E09), Skin (E000,E00, E01,E02, R20) Fence (E33, E35), Dress (Y35, black, R27) Watering can (C2, C3 and C5)I can't wait to use the other ones! I used Label 11 Nestabilities for the image panels and Label 1 Nestabilites for the piece behind the yellow prima flower. I have so enjoyed my little blogging break and the time I was able to spend with the my mom this past week as well as just doing some fun "no pressure" creating. I think though that I'm ready to get back to taking care of blogging business, so you should start to see me back on a regular basis. So, to start things off, here is my card for this week's "Cooking it up with Katie" challenge. 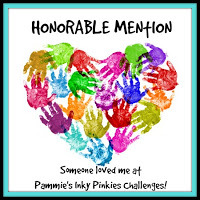 This week's recipe is to "Sparkle, Shine and Shimmer" It is sponsored by Pizzazz Aplenty who is offering a $10 prize pack to the winner of the challenge. 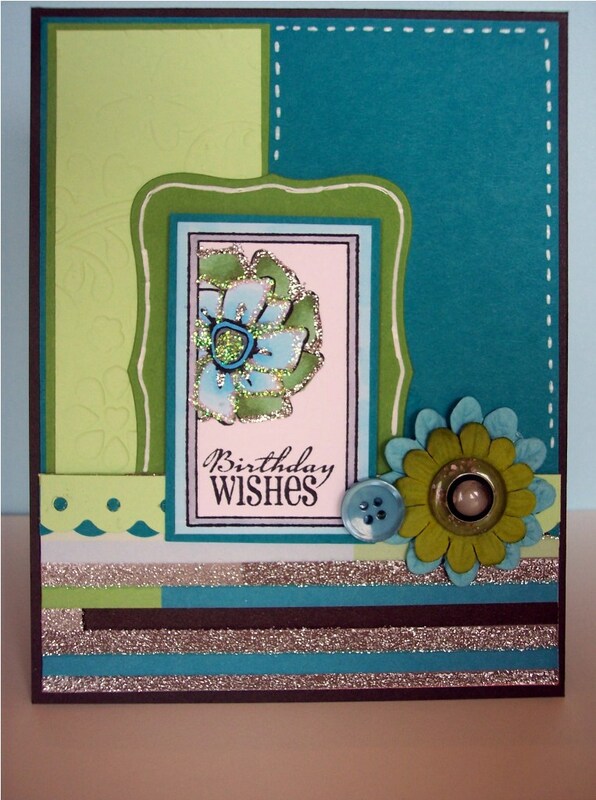 For my card, I started with a piece of Smoky Shadow from PTI and used Teal, Gable Green and New Leaf for my coordinating colors. The sparkly paper down at the bottom is from "The Glitter Stack" by DCWV. The image is from Verve Stamps and I colored it with Copic Markers and then outlined with Silver stickles and diamond stickles as well. Be sure to stop by and visit all the other DT members to see their gorgeous creations as well! As for me, I'm off to plan my next creation! Have a great day and I'll see you tomorrow!! I hope you are all having a good week. I am here to share my card for this week's Cooking it up with Katie Challenge. 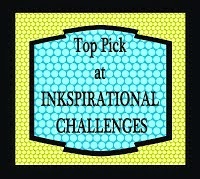 This week the challenge is to use Buttons, animals and lots of color. This week's challenge is sponsored by MelJen Designs. They gave us such adorable images to use for our DT examples this week, so make sure you visit all the blogs this week! My mom is here visiting with me this week, so excited!! She's a stamper too so we are off to do some shopping at Michael's and Hobby Lobby this morning and then some crafting this afternoon. Yippee!! Lot of other fun stuff planned for the week too, so I'll be back next week sometime with regular blog posts again! Until then, enjoy the beautiful weather if you're getting some and if you're not, well.... grab a hot beverage, and happy crafting! Just here quickly to share my card for this week's OCL challenge. You know me and OCL, I just can't stay away from their challenges. 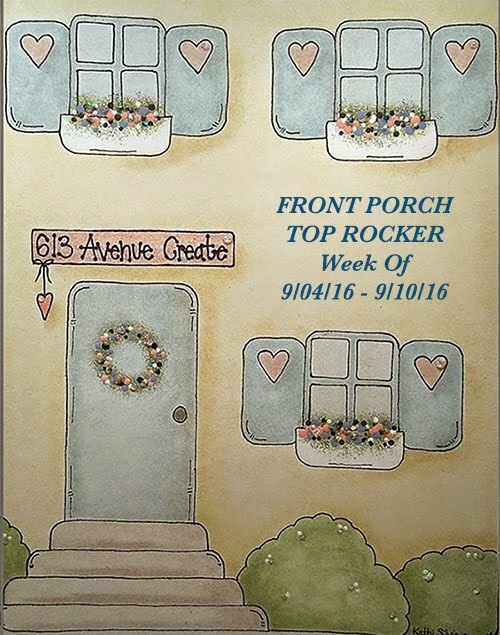 Last month they did a blog hop and I won a free set! This set is called "Circus Circus" and as you can see I used the little elephant. Yippee!! I decided to use it for the CAS challenge they are having this week. 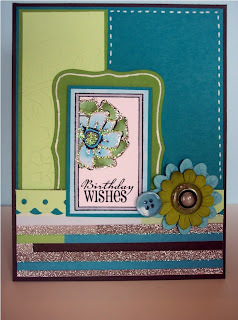 The challenge was also to focus on embossing and I chose the Blooms and Dots embossing folder. I used Sweet Blush with some Grey and white. I added some silver stickles around the scalloped grey circle just to add a bit of sparkle. I stamped the little elephant with Memento Ink (Tuxedo Black) and colored it in with C1, C2 and C5 Copic markers. I hope you all like it! Enjoy the rest of your weekend! I actually scanned this card instead of photographing it...just another symptom of blogging laziness LOL! That's why the greens are a little off in the picture. Anyhow, that's all for me today! I hope you can all play along with the challenge this week. The winner will receive three images!! Eventually the question becomes "Do you craft so you can blog? 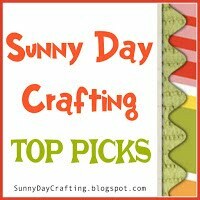 or Do you blog so you can craft?" If I didn't have a blog, would I be crafting with the obsessive addiction that I do? I would like to say yes I would be, because I truly enjoy crafting; and I really do enjoy blogging as well. I think however, that it is just time to take a bit of a blogging break. Just a couple of weeks to spend time creating and crafting for the pure pleasure of doing it and nothing else. Next week is Spring Break for the kiddos and then my mom is coming to visit the week after that, so I am signing off until April 1st. Happy crafting to all of you!! Cooking it Up with Katie! It's Wednesday, so that means its time for another challenge over at "Cooking it up with Katie" This week we are being sponsored by "Sassy Studios" and they gave the DT some really awesome images to play with. I couldn't decide which one to use, so I decided to make one with each! The challenge this week is to Pack a punch, make it sweet; and a little sassy too. 4. Cardmadfairy Digi Days: Digi with some glitz and glamour. I can't wait to see what everyone does with this challenge! The winner will receive 4 images from Sassy Studios. I hope you all had a good day yesterday. I actually made both of these cards yesterday; but just did not get a chance to get them posted until today. I am actually off to Tyler's first gymnastics competition this afternoon! We are very excited! 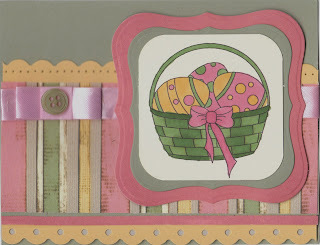 For the first card, I used Ripe Avocado, Fine Linen, Melon Berry and White (all PTI) for my color combination. I used the Birds and Swirls cuttlebug embossing folder on the Fine Linen piece. I then took some Tea Dye distress ink and a blending tool and went over the embossed area. I used peeled paint around the edges. The image stamps are from a set of Clear Dollar Stamps I have that I stamped using various chalk inks. The second card I also uploaded to my SCS gallery for sketch #2 for March's Viva La Verve challenge. I decided not to enter this one into any challenges: but I hope that you like it! I am here today to share a couple of quick cards I made yesterday using my new Verve Stamps "Up, Up and Away" Believe it or not, I am not linking these to any challenges because amazingly enough I couldn't really find any that I could link them to. 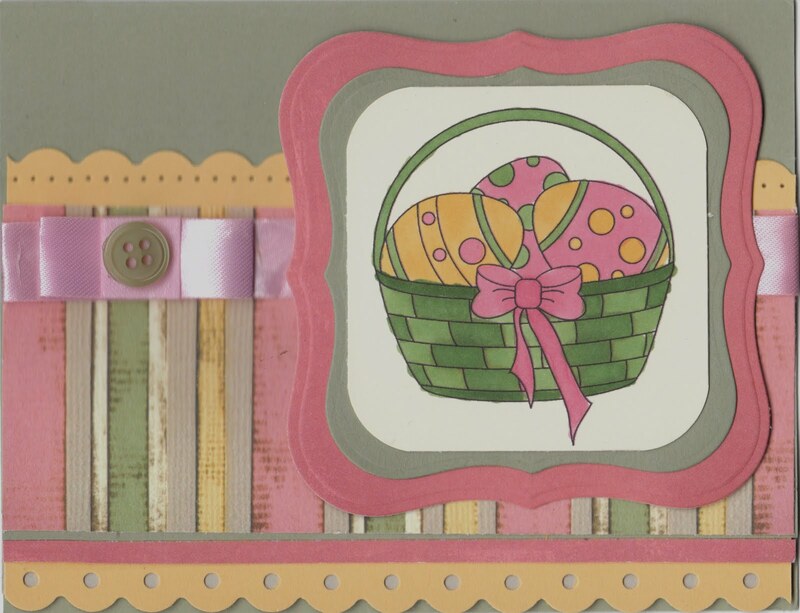 For the first card, I chose a bright fun color scheme using some new colors that I got from PTI. Orange Zest, Hawaiin shores and Simply Chartreuse. I embossed the blue background piece with the Argyle Embossing folder. I did some score lines on the green piece; but they didn't show up well in the photo. I used Label 8 Nestabilities for the main image panels and then stamped the images in Rich Cocoa ink by Memento and colored with Copics. The two small butterflies are from a Penny Black stamp set I have. The second card I have to share today is for the first week of March's Viva La Verve Sketch challenge going on over at SCS. I am e xcited about participating in this challenge for the first time and I am looking forward to the next sketch which will be posted on Friday! This card is definitely one for the boys with all the blue and green. I used Enchanted Evening, Spring Rain and New leaf for this card. I stamped the balloons win Tuxedo Black ink by Memento and then colored them with Copic Markers. I stamped the words in the center of the balloons and then covered each one with some crystal affects to give them a nice shiny look. The picture is a bit tilted because I had to take the photo from an odd angle so that the shine didn't reflect off the balloons. Anyhow, it was a very simple card; but one that I think still turned out well. Hi Everyone!! I have some super exciting news to share with all of you today!!! I have been invited to join the wonderful design team of "Cooking it up with Katie" Now, I know many of you have been participating in Katie's challenges for a while and are very familiar with the blog and all of her fun challenges. I am so blessed and grateful for the opportunity to to be able to work with such an amazing team. This week's challenge is sponsored by the wonderful Teddy Bo and Co. digital stamps. They were so kind to share some of their images with us to be able to do some samples for you for this week's challenge. Be sure to stop by and visit their store. They have positively delightful images for you to see. They are giving away 5 images to the winner of this challenge!! Yippee!!! Also visit the other team members blogs to see the gorgeous samples they created! This week the challenge is: Spring, Flowers and Yellow. It seems as though now that we are done with Valentine's Day themed challenges that the challenge of choice is now Spring Theme; and on that note, this card fits an unbelievable 14 challenges!! Phew...I am going to be busy today!!! Thanks for stopping by and looking. Enjoy the rest of your day! !